**My Desert Cottage**: Tutorial for sale! Now that the Artist Class Garden party has wrapped up Mary has generously released our tutorials for us to sell on our own. It's a wonderful opportunity to purchase just the tutorials you want. 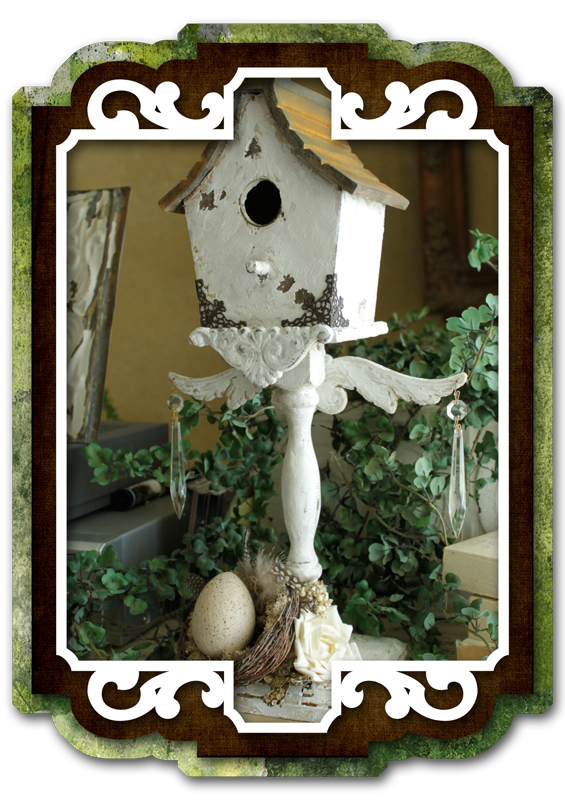 If any one would like to purchase my Architectural Birdhouse Tutorial it is available here for only $5.00. You will also find the link on my left sidebar. Thank you so much!!! I will be back soon with some more posts. I have been so busy adding all the party participants, emailing responses and trying to keep with with blog work that I feel like I'm really missing all my friends. It's temporary though and I'm sure I will be back visiting you all very soon. Have a great week! Hi Karen, Welcome back! You have been busy-me too. I'm running a catch up session tonight. Back to computer dead zone for a few more days while I petsit for a person with dial-up. This birdhouse is adorable. I need to find the time to get creating again. I actually made my birdhouse using the wonderfull tutorial of yours, I will post about it today-or tomorrow, it was a very fun project. I can't believe you are up to 248 comments!!!! I finally added a button with a link for your party.....can't wait!!! Your Pages in Where Women Create were lovely. I'm so excited for the 19th! Love love love the blog design you did for Lady Pamela's blog!! Always love my visits here too. Karen, Loved the article about you in Where Women Create magazine and the chance to get to know your story. I just am in awe over the framed collages on your wall - especially the 3D effect of the images. Your studio is beautiful! Hello busy lady wishing you a Happy Mother's day! Hi Karen, I have been trying to get a hold of you through email and it is not working on my end. I would like some help and a price list. Would you please drop me a line at SKZ123@AOL.COM. Thanks for the link to the tutorial. I was just visiting the blogs you have links to underneath your header. They are gorgeous. Hi! I'm a new follower! I'm acited about the "Where Bloggers Create" !!!! Look forward to getting to know you and your blog better! I finally added a button with a link for your party.. This birdhouse is adorable. I need to find the time to get creating again.